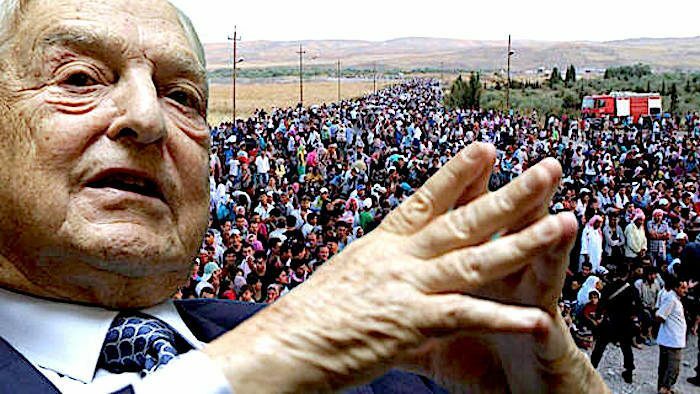 Globalist billionaire George Soros is backing attorney’s who are helping the Central American migrant caravans that are headed to the United States border with the intent of entering under the guise of seeking asylum. Currently, there are close to 3,000 migrants in Tijuana, Mexico, awaiting the arrival of other Central American migrants who will continue to travel to the U.S. southern border. There are reports that they plan to “rush” the border knowing that some will be caught, but the larger their numbers the more will have a chance to get through. On Monday afternoon, Homeland Security Secretary Kirstjen Nielsen tweeted out photos of CBP officers in riot gear as well as the barbed wire and barriers citing the reports about plans to “rush” the border. At one point the caravan was anywhere between 7,000 to 10,000 members strong and mostly consists of migrants with ineligible asylum claims, which include job-seekers, previously deported illegal aliens, and Central Americans looking to get away from crime. None of these are eligible asylum claims, Breitbart reports. Last week, Breitbart News reported how caravan migrants in Tijuana began scaling the U.S.-Mexico border fence. In response, the Department of Homeland Security (DHS) has placed razor wire along the fence. Locals in Tijuana protested against the arrival of the caravan migrants, as Breitbart News reported, demanding they leave the city. Over the past few weeks, the active-duty servicemen deployed under Operation Faithful Patriot have mainly been erecting barbed-wire fences along the border in Texas, California and Arizona, as well as building shelter accommodation for customs and border protection staff. To ensure the success of the military operation, in addition to sheer troop numbers, the US forces have drones, helicopters with night-vision capabilities, and fixed-wing aircraft at their disposal.